Anyway, back to the AMAZING food at CraftSteak. I believe that the best way to sample a restaurant is to let the chef choose what to bring you. I heart tasting menus! Craft Steak has tasting menus in a few price ranges, which is even better. We decided to go with the “Domestic Wagyu Beef Chef’s Menu,” which features two cuts of steak from a blend of Australian Wagyu and Domestic Prime cow. Speaking of cow, this place does not let you forget that that’s what you are eating. 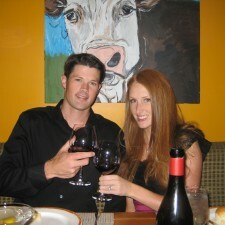 The booths are covered in suede, and the walls are covered in whimsical paintings of smiling cows! There were probably a bunch of other subtle references that I missed. 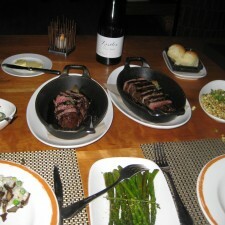 The Filet Mignon and Ribeye steaks were really good, but the tasting menu sides completely stole the show. 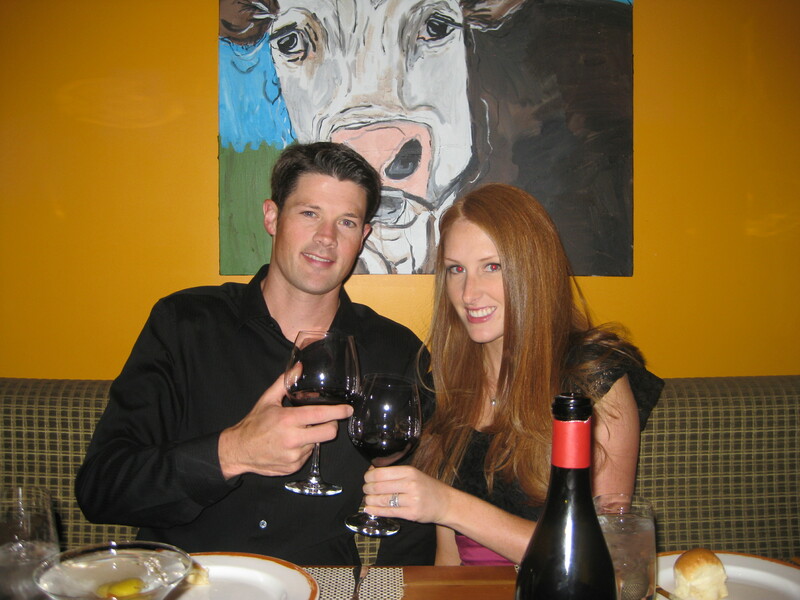 We started out with Hand Cut Wagyu Beef Tartare, for which I would return in a heartbeat. We also got shrimp cocktail, the best mushroom risotto I’ve ever eaten, and corn. Let me tell you about this corn. I am not normally a big corn eater. Corn on the cob a few times a year in the summer, and sometimes Victor will order some creamed corn for the table, but I never really crave it. This corn was out of this world!! I am not even sure what they did to it. Call them and ask them. Don’t go if they don’t have corn, you would really be missing out. There was also some asparagus and some other stuff on the table. Doesn’t matter. The corn won. By the time dessert came, I was in a total food and wine coma and could have cared less, but I am so glad it came with the menu. Otherwise, I never would have ordered it and would have missed out on some seriously great stuff. There was something chocolaty, some kind of berry something, crème brulee, and some sorbets, but all I remember clearly is the house made mint ice cream. Not green fake mint flavoring like you are used to, but like real mint leaves. SO incredibly refreshing after this monster of a meal. 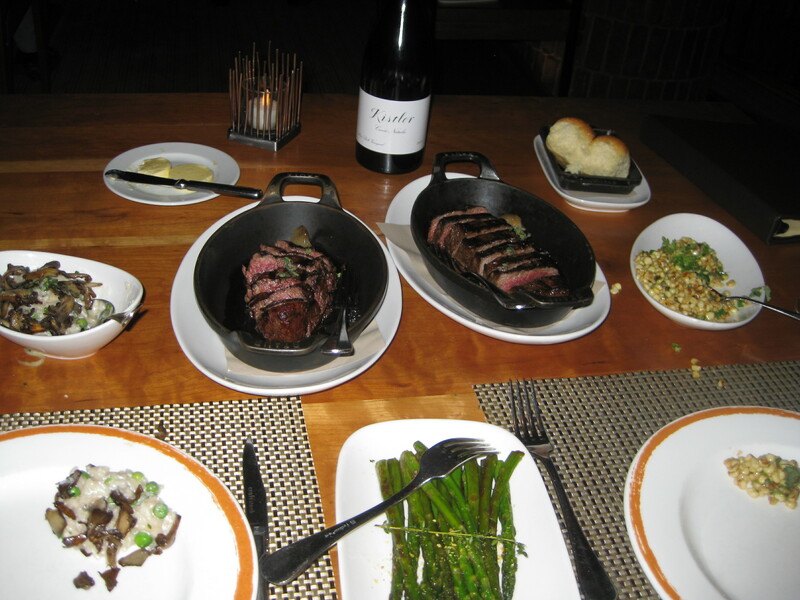 I can’t wait to visit Vegas again so I can (stalk Tom Colicchio) and eat at CraftSteak again!